Uses the Google Maps API to make points from the Location Search viewable on a google map. Uses an AJAX update, which I'm quite pleased with, to fetch markers as you drag the map around. Also pointless Moon version. Thanks to dynamite local for the idea. UPDATED: 1-8-05 now adds a link to Google Earth (just under the map), soon this will open similar extents! 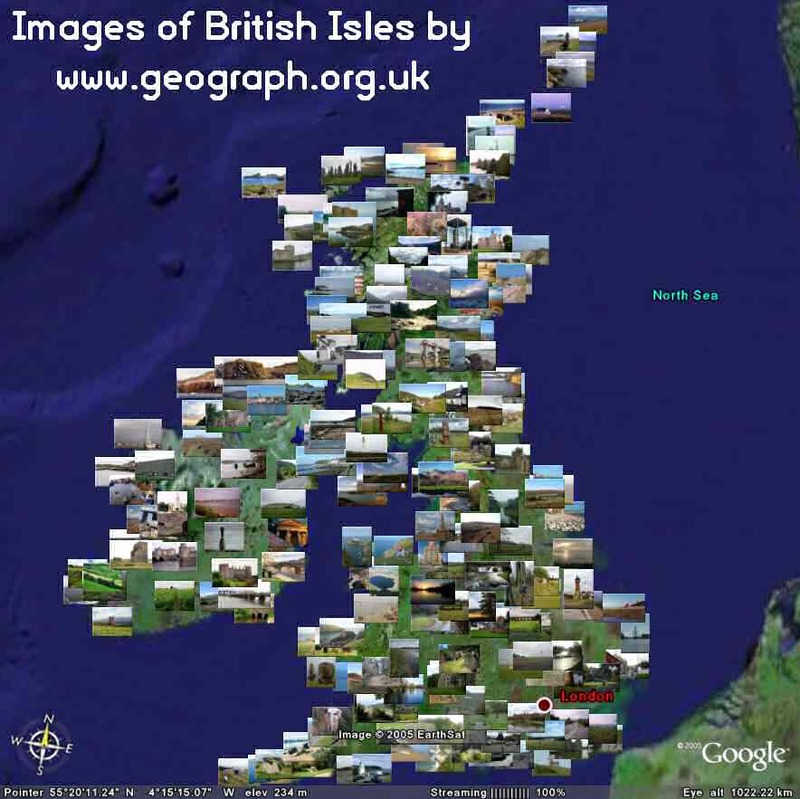 View latest images and results of searches directly in Google Earth! Thumbnails of the photos themselves for the marker. See this page (or Forum) for more details, now includes view based refresh. Here is a teaser: 15 Latest Images Submitted, lots more is possible! Thanks to geobloggers.com for the idea. UPDATED: 01-08-05 now adds a link to Google Maps into the popup. This also tries to open the map to have a similar coverage to that on Google Earth! UPDATED: 28-09-05 now places a more accurate center marker thanks to the new <viewFormat> tag, you will need to re-download the kml file! Download options include a KML export. Perform a search, choose Download File, and select Google Earth in the dropdown, simple! Open to get a Network Link that adds a marker for each Postcode in the Current View. Currently works in the UK, US and Germany. Open to get a simple Network Link that displays a Balloon that just echos back the BBOX and LOOKAT values, nothing more nothing less. Open for the same again but this time plotting UTM gridlines, which should work worldwide. I don't know that much about UTM, so please treat with care! See this page for more information, basically displays the number of photos taken as a 3d bar map. Small utility to take a saved KML of placemarks, and generate a new one with the placemarks sorted into order. Very basic but should be functional. Coded to get round the deficiency in the client where no sorting is available. Along the same lines 'Geograph Hectad's in Google Earth' have created coverage bar graphs for all the layers in the Location Search. Just click the 'Bar' link on this long list of layers. (that page also has links to view the layers normally). See also my post about the specific geocaching/trigs layers at the Groundspeek Forum. Open to get a marker in the center of the current view that is has a name equal to the IARU Locator for the position. Open to get MGRS/UTM gridlines. Very similar to the UTM layer above, but with two differences: 1) the central marker displays a 1m MGRS reference, and 2) grid-lines will are plotted to 10m resolution (vs 1km). I don't know that much about MGRS, so please treat with care! 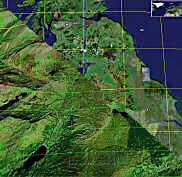 Layer of all Geograph Images, exploiting the new Region functionality of GE4 to only fetch and load detail as you zoom in, in this way the view starts depicting a course overview of the current coverage, zooming in reveals more detail until pictures themselves become visible. The MGRS layer above packaged up for use Offline. With instructions for setting up a local webserver. Google Maps includes the ability to create directions taking in many points, however it doesnt offer the ability to directly save these routes. And Google Earth doesn't (yet) offer the ability to do mutli-destination routing. So this page is an attempt to provide the little bit of missing functionality to save routes from Maps, and view them in Earth. Everything below this point has NOT been updated since mid 2006, sorry about that! Alpha preview here of the Map. Take results where Flush-Brackets have been joined into levelling lines and plot these in google earth... Can use the Polyline in Google Maps, and plottable lines in Google Earth, to make the results more pretty than in the above Intereactive Map. yourhistoryhere.com - "Mapping Britains Hidden History".